Gunther Van Der Reis' works are strongly landscape orientated. His main inspiration has always been the aesthetic surface of the painting. This Gunther Van Der Reis explores through various media such as oils, acrylics, vinyl acetate, epoxy, stainless steel as well as bronze sculpture. The emphasis on a luminously activated surface runs through all his works no matter what the medium. It harks back to his early years when he grew up at the sea in the Strand and always had a passion for the rugged rocks and mountains and generally, for the splendid environment of the Cape. As a young artist Gunther Van Der Reis was introduced to the works of Spanish artists which gave a lifelong direction to his work. The intense exploration of the objectified surface remained a dominant factor in his work throughout his career. 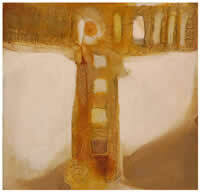 Much of his work emerged during the early sixties when a group of South African artists worked along these lines. They were strongly influenced by Arte Povera, which had spread in Europe and was largely publicised by Italian critics. The works of this movement had an earthy quality and the colours used accorded well with the nature and visions of our Karoo landscape. This, in the work of Gunther Van Der Reis, resulted in impressive paintings with rich and warm textures. In essence, in his constant quest for the aesthetic surface, the artist achieves something which is very unique. He captures, as perhaps no other South African artist, the raw beauty, the rugged splendor and glow of the South African landscape. Born Hamburg, Germany, 1927. Gunther Van Der Reis came to South Africa with his parents in 1937. Training at the Michaelis School of Art, University of Cape Town and later MA Art at the University of Pretoria. Taught at Schools in Cape Town till 1956 and then came to Pretoria to teach University of Pretoria students at the Pretoria Art Centre. Later lecturer at the Pretoria Education College. Joined the art department of the Pretoria Technikon in 1963 ,first as lecturer and later as senior lecturer responsible for painting and graphic art. Full-time artist since 1988.